Cup by precious cup, the Cuisinart SS-1 Cup-O-Matic Single Serve coffeemaker promises the best. No more half pots of undrinkable leftover coffee to throw out--with the Cup-O-Matic you get that fresh cup every time. Push button controls give you selection of flavor intensity and two cup sizes, and the large 60 ounce reservoir gives a minimum of five large cups per filling. Internal charcoal filtration removes unwanted flavors from the water used for the brew. 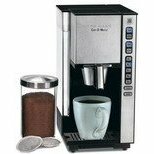 Ground coffee or coffee pods are equally acceptable to this fast and versatile machine. In reality, we only wish it were always so. The Cuisinart SS-1 is consistently noisy, and from there the expectations for this now discontinued product only decrease. Faults are many and varied, with problems concerning operation with ground coffee rather than coffee pods, excessive vibration, and simple refusal to operate. Although this coffee maker does have a three year warranty, and the quality of the brew is good enough to justify the noise when it's a good machine without flaws, customer service is now limited to refunds minus the cost of shipping, and there have even been frequent problems with that. The Cup-O-Matic SS-1 is a gamble. Here's a 12-cup coffeemaker by Cuisinart to consider.